If your business relies on vehicles to make deliveries, conduct repairs or to meet with clients, it is imperative that they remain in excellent running conditions at all times. Whether your fleet is a single sedan or multiple big trucks, fleet maintenance is crucial for many reasons. Be sure to trust a professional auto repair shop to complete maintenances so you know that they are done right, as one small business is much more likely to offer excellent service to another small business, when compared to any chain or big box auto shop. Talk to your local shop about setting up a fleet vehicle maintenance program so you can take full advantage of great running cars and trucks in your fleet. Whether you make deliveries, haul tools or just meet with clients on the job, if your fleet is broken down, well, then you're not going anywhere. A well maintained fleet is a fleet that will get you where you need to be, when you need to be there. By completing routine auto maintenance for your fleet vehicles there is a much lesser chance that they will ever break down or need more extensive repairs. The money you spend on preventative maintenance will be a lot less than the money you would spend if your vehicle suffered some catastrophic failure. Being on time is critical. In today's world it seems people schedule every single minute of everyday, so if you're not there when you say you are, you can bet your customer approval rating is going to sink, which is exactly what will happen if your cars or trucks are not running as they should. When all's said and done it all comes down to the bottom line. A well maintained fleet is going to use less fuel, not break down and get you or your staff to every single appointment that you have on the calendar. What do all these things translate to? Happy customers who are more likely to use you again and refer you to others. If you utilize work vehicles and require fleet vehicle maintenance in Mountain View or the surrounding California communities, be sure to visit The Car Doctor. 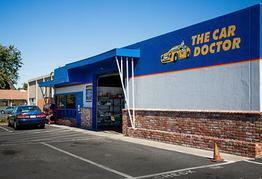 Our team of auto repair and maintenance experts service all types of vehicles at our full service shop. Give us a call at (650) 492-6853 to request superior fleet maintenance in Mountain View or Palo Alto today.